I am a Tabasco man, always have been. Sure, I love lots of hot sauces, but for me the alpha and omega of pepper sauce is Tabasco. There’s something about it that is more than just heat and vinegar, something more refined and mellow. I had no idea what that something was until I got a chance to visit Avery Island, Louisiana, and meet the McIlhenny family face to face. Touring the plant, I was shocked to learn that the recipe for Tabasco is not some closely guarded secret. They’ll gladly tell anyone who asks what it is: Tabasco peppers, 2 1/2 percent salt, vinegar… and time. Lots of time. Winemaker-style time. Tony Simmons, the company’s CEO, walked me through it. The Tabasco chiles are chopped up, mixed with salt mined right from the island itself, then poured into old oak barrels to ferment in a barn for up to five years, although most of the mash is fermented only (!) three years. They then mix the mash with distilled vinegar (they used to use white wine vinegar) and let this pickle for a month, mixing all the way. Finally, they strain out the pulp and seeds and bottle the sauce. I was fascinated by this. Aged in oak? For three years?! Damn. Gauntlet thrown, Tony Simmons. One I will gladly pick up. Two years later, here’s how it went. I decided to not even try to replicate Tabasco Sauce exactly, because why would I want to? Even if I succeeded, I can buy the stuff easier at the supermarket. I’d use the method, with different chiles. 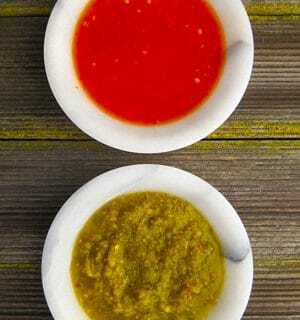 And I’d make two sauces: One red, one green. I grew a lot of chiles two years ago, so I used an eclectic mix of serranos, Tabascos, ripe padron chiles, and a few Thai chiles tossed in for good measure. Yes, I know doing this makes this sauce unrepeatable, but so be it. No vintage of a wine is exactly repeatable either, and since hot sauce keeps almost as long as wine, it’d be fun to play with annual vintages. I waited until late September 2012 to harvest all my chiles, and I grabbed both the red and green. I stemmed them all and chopped them roughly, then tossed them in a food processor with that critical 2 percent salt — this is enough to protect the chiles from bad bacteria but not enough to prevent fermentation by the good bugs. Into quart Mason jars they all went. Within a day they were fermenting, with an acrid, slightly yeasty smell that was something like a cross between Mace and a loaf of bread. Not that unpleasant, actually. I stirred the mash every day and let it breathe. After about 10 days things settled down, so I moved the jars into my salami fridge, which is a cool 55°F. But before I did that, I grabbed some toasted oak cubes I had from winemaking and tossed them in. Instant oak barrel! And then I forgot about my hot sauce. For two full years. OK, that’s not totally true. Every few months or so I’d check on them, and once in a while a film of mold would grow on the surface; this happened three times. I just picked it off and called it good. After all, we’re dealing with chiles and salt here, both of which are pretty inhospitable ingredients to any truly bad wee beasties. Finally, earlier this year I decided to make my sauce. I stared at that awesomely fermented mash, which was at once mellow and smooth yet muy picante, if such a thing can exist. I just couldn’t discard it. So I pureed it even smoother and added a little xanthan gum to stabilize it. The result is a lovely hot sauce. 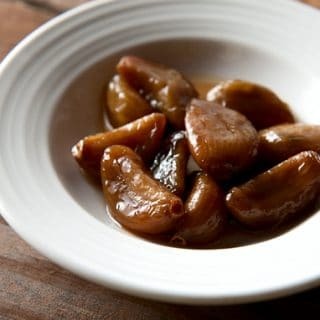 Tangy from the fermentation, hot but not overbearing (a result of the mix of chiles I used), vinegary and a bit salty. It’s not Tabasco. It’s something different. Something… better? Perish the thought. There are lots of variables going on with this seemingly simple sauce, so don't freak out if it doesn't taste exactly like Tabasco. It'll still be great. 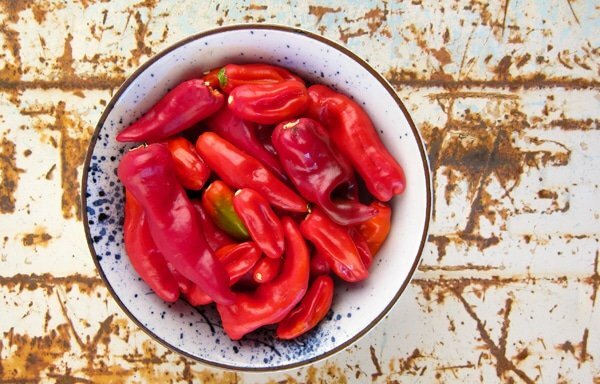 Your chiles will affect the flavor, as will where they were grown. So will your salt -- don't use iodized salt, it will muddy the flavor -- and your vinegar. Tabasco's private stock is made with white wine vinegar, and it is noticeably better tasting than the stuff you buy in the store. Use a good vinegar. And you really need the toasted oak cubes to get the full Tabasco effect. They store their mash in oak barrels, and unless you are making that much sauce, the oak cubes are the way to go. You can buy them at any winemaking shop or online. Try to let the mash ferment as long as you can. Every month you let it go makes it better. Finally, this recipe can be scaled up or down. Just remember, the key ratio is 2 percent salt by weight of the chopped-up chiles. Roughly chop the chiles and compost the stems. Blitz the chiles in a food processor or blender with the salt and water until you get a rough paste or slurry, depending on how much moisture there is in the peppers themselves. I keep the seeds in the chiles, but if you want a milder sauce, remove them. Put the mash into quart mason jars and cap them loosely. "Burp" the caps at least once a day to let out escaping gases and let air in. The chiles will ferment like this for at least a week, and sometimes up to 3 weeks. When the chiles settle down, add the oak cubes, distributing them evenly throughout the jars. Tighten the lids and store the jars in a cool, dark place. I kept mine in my salami fridge, which is 55°F. A basement is fine, as would a fridge. Tabasco keeps their mash barrels at ambient temperatures, which in Louisiana can top 100°F. I am working on a batch fermented this way now, and I see no reason it won't work. Don't let the mash freeze, however. Keep the mash like this no less than 3 months, and up to 2 years. When you are ready to finish the sauce, mix the mash with the vinegar. You now have two choices: You can do what Tabasco does and return the mix to the jars, shake them every day for a month and then strain out the pulp and seeds. Or, do what I do and keep all that pulp, which will give the sauce body and thickness. 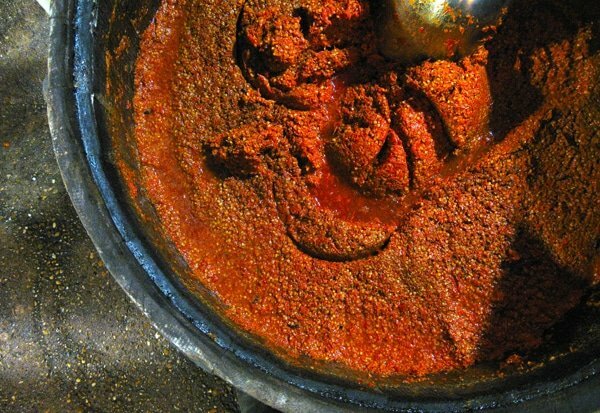 If you choose my method, you will need to really blend the sauce and stabilize it -- otherwise the sauce will eventually separate and will need to be shaken up before each use. To do so, dissolve the xanthan gum in 2 tablespoons of water and add it to the blender. Blend for a solid minute. Let the sauce rest for 1 hour before bottling so any trapped air in sauce (from the blending process) can escape. Bottle and store. The sauce will keep for a year or more. Note that this is a long-ferment hot sauce. 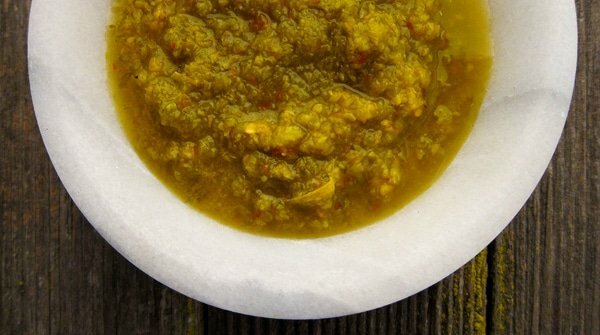 Click here for a quicker hot sauce recipe. Find tons of recipes for more hot sauces, condiments, pickles and preserves on Hunter Angler Gardener Cook! I just poured my fermented hot pepper sauce out of an oak barrel I had purchased for the experiment. I put it in the barrel on 9/28/18. I was so excited, and am now horrified to have found a big blob of black mold. Makes me want to shed a tear, and not because of the Scovilles. Waah! Next year I use your oak block idea and put it in a container I can look in.